A luxurious ensuite or master bathroom suite is something every homeowner dreams about having and designing. Creating the perfect ensuite can take some creativity and ingenuity. If you are looking to achieve this in your home, we have developed 10 ideas to create your dream master bathroom suite. Keep them in mind while you are going through the design of your new home. Think about the things that make you unique and add them to the design of your bathroom. For example, adding a custom vanity table or high-quality tile design may be the best option. Consider what your future needs will be or what design will look like in the future. Adding these elements to your master bath can help it look extremely chic. Some great options for this would be a hidden shower or a sunken tub in the middle of the floor. Make your bathroom really unique by adding interesting splashes of color in interesting locations. Some of the most trendy accent colors in 2016 are yellow or even black on a gray or white palette. Want More Detailed Ensuite Ideas? If you are located in Maryland, Washington DC or Virginia and you want to talk about more cool ensuite ideas, let us know! You can also make your bathroom interesting and inviting by using natural materials. For example, natural stone, marble, wood and pebbles can be integrated beautifully. And natural lighting makes a room look fresh and clean. Your bathroom design doesn’t always have to be kept indoors. If you have the space, consider adding an outdoor, private oasis onto your bathroom design. If that’s not possible, build your shower with no boundaries – in other woods use a frameless clear glass or no glass at all inside your oversized tile shower. One of the best ways to increase your comfort in your bathroom is by adding heated flooring to your design. Technology is quickly taking over our lives. 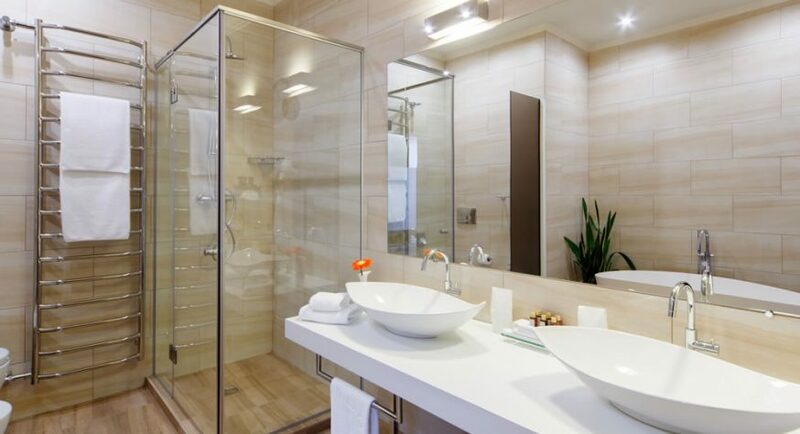 Adding it to your bathroom in the way of hidden televisions, bluetooth enabled tubs, hidden cabinet speakers, and programmable shower settings can make for the ultimate dream master bathroom. You will also want to focus on adding the proper amount of lighting to your dream bathroom. Sometimes, variable lighting could also give you a surprising amount of comfort. Custom lighting around a vanity can also help make it easier to get ready in the morning. Creating the right amount of storage in your master bath can help cut down on clutter, which will make your bathroom more comfortable. Some unique storage options would be around the door or hidden drawers in your linen closet. Whatever your ultimate design is, use it to make a statement with your master bath. This can help make your master bath fit your personal taste in a unique way. Whether your statement lies in a chic design or in ultimate comfort, using it to create the bathroom of your dreams is a fantastic option. These ideas are all fantastic ones that will help you create the master bath of your dreams. You will definitely want to remember them while you are putting together the plans for your new home or space. If you are located in the Washington D.C. or Maryland areas, and you want to find out how we can help you design the master bath of your dreams, contact us today.